While both Tungsten and titanium rings offer numerous benefits, like everything else, they too come with disadvantages. When it comes to buying your wedding band, it’s important to understand both the positives and negatives of each style before carefully deciding which one is the best fit for you and your lifestyle. To hopefully make things a little bit easier for you, we have broken down the pros and cons of both Tungsten and titanium rings so that you can see and compare them side-by-side. High degree of strength and durability. Highest strength-to-weight ratio of all transition metals; titanium is stronger than steel while being lighter than aluminum. Lightweight. Titanium is extremely light in weight with a density of 4.11 compared to Tungsten’s density of 19.25, which factors into comfort and ease of wear – it will feel like you have a feather around your finger! 100% hypoallergenic – great for those with sensitive skin or who are allergic to gold or other metals. Scratch resistant. Titanium does hold a certain degree of scratch resistance, although it is lower than Tungsten rings. Resistant to corrosion and tarnish. All bands are comfort fit. Luxury look at an affordable price. Titanium rings are much more affordable compared to silver, gold and platinum. Resizing, although it can be done, is going to be expensive – more than resizing a silver, gold or platinum ring. Because titanium is so strong, it is extremely difficult to work with, making even small size adjustments or repairs a big task. It can be nearly impossible to style titanium into intricate designs, and that is why you generally only see traditionally shaped wedding bands, however, they can be inlaid with other metals and/or stones to add to the overall design and lend a more appealing aesthetic. Extremely scratch resistant. In fact, Tungsten is the most scratch-resistant metal known to man. 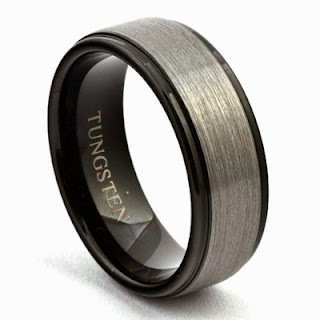 Tungsten’s degree of durability is unmatched, and because of this, Tungsten rings will maintain its finish forever and stay beautiful for a lifetime of wear. Tungsten is available in multiple colors options including classic gray, white, black and gold plated. All Tungsten wedding bands are comfort fit. Affordability. Rings made of Tungsten are much less expensive than rings made of gold, platinum, and even silver. Cannot be resized. If you lose or gain weight, you cannot resize your ring for a better fit, instead, you must exchange it for the correct size. Potential to shatter or fracture if enough force is applied. On the bright side: this makes them easy to remove in case of an emergency where titanium rings are going to require some special tools and know-how. Can only be laser engraved. Traditional engraving methods are not suitable for Tungsten rings. However, they can be engraved and personalized with more modern laser engraving. 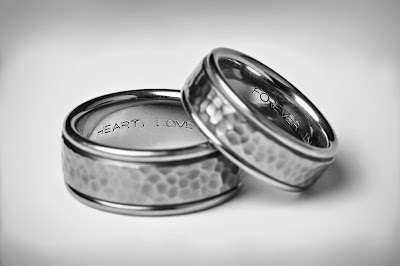 About the Author: Lovie Art Jewelry specializes in affordable wedding bands for men and women. Visit www.lovieartjewelry.com to save thousands on beautiful wedding rings and bands!